Melbourne’s central city area has traditionally been defined as the “Golden Mile”, which is the checker-board survey by the government surveyor, Robert Hoddle, who in 1837 fixed a township of six blocks by four blocks. The boundaries were Spencer, La Trobe, Spring and Flinders Streets. The “Golden Mile” sufficed until the postwar years for defining Melbourne’s commercial and retail heart. During the 1960s town planning surveys extended the northern boundary to Dudley Street, the Queen Victoria Market and Victoria Street. Shortly afterwards notions of a central business or activities district pushed the boundaries of the “central area” into East Melbourne, down St. Kilda Road, beyond Flinders Street and across the Yarra River to Southbank and beyond Spencer Street to Docklands. Postcode boundaries have not mirrored these expansions, and the Queen Victoria Market is in the West Melbourne postcode. This discussion will begin with the “Golden Mile”, but with that area extended southwards to the Yarra River because of the river’s port facilities. In August, 1835, two parties of settlers arrived in the vicinity of Melbourne. Both were from Tasmania. Captain John Lancey entered the Yarra River in the boat “Enterprize”, a vessel owned by John Pascoe Fawkner and sent over for the purpose of settling Fawkner and others at Port Phillip. Lancey anchored west of Spencer Street on 29 August, 1835, and completed the unloading on cargo on 2 September. While Lancey was on his way up Port Phillip Bay the second party was camped at Indented Head on the Bellarine Peninsula on the west side of the bay. That party, under Robert Robson, master of the “Rebecca”, included Mr. and Mrs. Henry Batman, and had been at Indented Head for nine days when the parties caught sight of each other on 16 August. John Batman joined his party at Indented Head on 23 August. On the day that Lancey finished unloading, members of Batman’s party arrived by foot at the “Enterprize” settlement to announce that Lancey was camped on land “purchased” by Batman from the Aborigines. The “Enterprize” party stayed put, and the title to who first settled Melbourne remained contested one hundred and fifty years later. When Lancey first entered the river mouth he went up the westerly stream, the Saltwater or Maribyrnong River. Drinking water was a long way upstream. He subsequently found that the easterly Yarra River had a rocky falls which, mostly stopping the inflow of sea water, kept drinking water salt-free a short way upstream. The river also had a wide basin downstream from the falls. The river’s geography dictated the place of settlement. Batman’s party apparently realised the suitability of the place, as Henry Batman and his family arrived there on 16 September, 1835. Fawkner arrived at Melbourne on 11 October and John Batman arrived on 20 April, 1836. He occupied a house at Batman’s Hill, west of Spencer Street. On 10 June, 1838, it was reported to the Governor of New South Wales that the settlement, “Bearbrass”, had a European population of 142 males and 35 females. On 9 September Governor Bourke reversed his view that the settlers were trespassers, authorized the settlement and appointed Captain William Lonsdale as the settlement’s Police Magistrate. Lonsdale arrived on 1 October. On 4 March, 1837, Sir Richard Bourke arrived at Melbourne with the surveyor, Robert Hoddle. Three days later Bourke named the township Melbourne after William Lamb, second Viscount Melbourne, Prime Minister of England. He also approved the checker-board plan of Melbourne, prepared by deputy surveyor, Robert Russell, who had been at Port Phillip since the previous year. The plan of Melbourne was tilted towards north-north-west so that Flinders Street, next to the river, ran approximately parallel to it. Somewhat coincidentally a valley with a stream along it ran at right angles to Flinders Street, and Elizabeth Street ran along the bed of that stream. Elizabeth Street became a vertical axis, dividing east from west. Along the horizontal axis the ends were marked by Eastern Hill and Batman’s Hill. The main streets were 99 feet (30 metres) wide. Running parallel to the main east-west streets, lanes one-third as wide, were inserted. They were to serve as rear rights of way for properties. Most properties had an area of about two-tenths of a hectare. If the intention of the rear rights of way was to overcome the tendency for further subdivision, it did not succeed. The rights of way became main addresses, and a network of lanes was created by subdivision as they cut up the Crown allotment for resale. As the allotments ran from a main to a little street, the easiest subdivision was to divide them so they had a frontage to each street. Access to the properties’ rear was achieved by forming a narrow lane down the side of the property fronting the little street, ending at the common rear boundary of each property. By 1854 there were eight such lanes off Little Collins Street in the block between Elizabeth and Queen Streets. The other typical form of subdivision was to run a lane the full distance between a main and a little street, and cut up the allotments either side so that they had frontages to the lane. Some of these became attractive through-ways, surviving to the present, examples being Bank Place and McKillop and Hardware Streets. A further variation was the U-shaped lane system, the arms of the U being the entry ways off a main thoroughfare and the cross piece running parallel to the thoroughfare. Examples are Melbourne Lane, where the Kelvin Club is now situated, and the Guildford Lane complex which retains small two or three storey workshops and the bluestone shell of the New Theatre (1937). Other lanes were T-shaped, F-shaped and nondescript variations which ran around boundaries and yards. As well as providing access, the lanes brought light and air into buildings. The Guildford Lane complex, from a street directory, c.1947. Fifty years later the complex was unusually intact. The intricate webs of lanes served the central city area until postwar site consolidations resulted in many of them being built over. This is discussed under Postwar Melbourne. Nineteenth century descriptions of Melbourne described how yards and lanes were receptacles for rubbish and stagnant pools of water. The explanation for the condition of the lanes was that they were privately formed, usually abandoned by the subdivider, and the adjoining property owners or occupiers usually did not cooperatively maintain them. The Council avoided becoming financially involved. This meant that the worst examples were undrained, unpaved, uncleansed and unlit, unless the council enforced a health order or finally got around to doing something. West of Queen Street there were numerous sections (a section being bounded by three main streets and a little street), reserved from sale, together with half sections. The reserves came to be occupied by Police and Military Barracks, Government Offices, the Customs House, the Western Market and Roman Catholic and Anglican churches. No reserves were provided in Hoddle’s plan between Queen and Elizabeth Streets, although Welsh and Anglican churches were established immediately north in La Trobe Street. East of Elizabeth Street there were reserves on which were built St. Francis Catholic and St. Pauls Anglican churches, the library and police offices. Other institutional buildings, mainly by way of land grants, were Wesleyan, Baptist, Independent and Presbyterian churches, the Eastern Market, the general hospital, the post office and the town hall. Elizabeth Street ran down the middle of the town, and the Townend Stream ran down Elizabeth Street. The western end was the civic end, with the port and the first market site (1841). The Elizabeth Street gully or Townend Stream impeded traffic from the east, and in 1846 the Eastern Market was proclaimed on the south-west corner of Exhibition and Bourke Street. 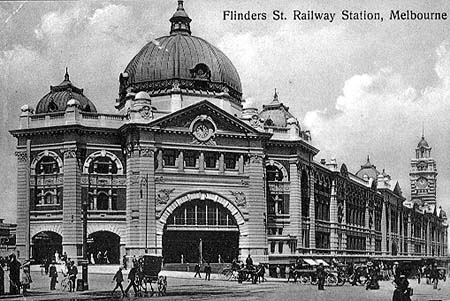 It absorbed a hay and corn market in Flinders Street, allowing the site for St. Pauls church and school to double in size. Melbourne was a country town, with a rapidly expanding pastoral hinterland as livestock were brought form Tasmania and New South Wales. Buildings were often hasty, temporarily run up affairs, usually made from bricks not well fired. If water did not get in through the bricks it could do so through weak mortar or roof shingles which shrunk in the summer heat. When the property booms came during the gold rushes and the 1880s, most buildings were weather-damaged or too small, and they were replaced. There are a few rare survivors, three of them being churches. The transepts and nave of St. Francis church, Lonsdale Street, were built in 1842. The brickwork is concealed by weather-proof mortar. In Collins Street the rear of the Baptist church (1845) survives, and its brickwork is similarly concealed. St. James Old Cathedral best shows off its stonework. Built in 1842 at the north-west corner of Collins and William Streets, it took the site of Melbourne’s all-denominations Pioneer Church (1837). 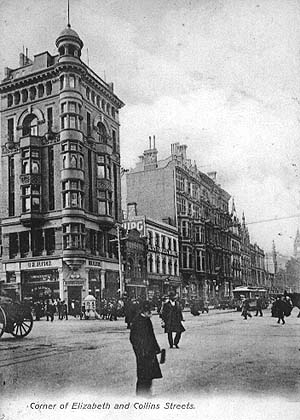 Its supersession resulted in its being re-erected in King Street in 1914. There are a few pre-Gold Rush secular buildings. Two former hotels, Oddfellows at 33 Little Lonsdale Street and Black Eagle at 44 Lonsdale Street, date from 1849. Others are Jobs warehouse, 58-60 Bourke Street (1848-9), and buildings at 300 Queen Street (1848) and 328-30 King Street (1850-1). Land sales were begun in June, 1837, when five blocks around Queen Street were auctioned in Sydney. Two blocks overlooked the river, either side of the section which included the Customs House reserve. Five months later another five were auctioned in the same vicinity, but northwards to Lonsdale Street. (Lonsdale Street initially was the northern limit of the town.) All were west of Swanston Street. In 1838 and 1839 further blocks were sold, first east of Swanston Street, then east of Russell Street and lastly east of Exhibition Street. The pattern of sales is suggestive of two parts to the township, and that in fact eventuated as most churches erected buildings either side of Elizabeth/Swanston Streets, and markets and police were similarly located. Flinders, Collins, Bourke and Lonsdale Street were suffixed with “West” and “East”. On 14 July, 1841, the New South Wales Governor Sir George Gipps approved the election of Markets Commissioners for Melbourne. They were elected from wards with boundaries intersecting at Bourke and Elizabeth Streets. On 12 August, 1842, the Legislative Council of New South Wales passed Act 6 Victoria No. 7 for the election and operation of a town council, with the same wards as the Market Commissioners. Fawkner was one of the twelve councillors elected. Melbourne was already a city when gold was discovered. Its city status had come with Bishop Charles Perry’s Letters Patent when he arrived in Melbourne and read the Letters from the steps of the uncompleted St. Peters Church of England, Eastern Hill, on 13 February, 1848. The secular confirmation of that event came with an Act of the New South Wales Legislative Council on 6 July, 1849, legally making Melbourne a city. The gold rushes dislocated the infant trades, and gold seekers tolerated tents and bark huts. Building activity recommenced in 1853 as population and unsuccessful miners sought conventional occupations and conventional housing. A program of public works and buildings began: a gas works was opened in 1852, and a larger one west of Batmans Hill in 1855; the museum and the university were opened in 1854 and 1855; the railway lines were opened between Port Melbourne and Melbourne (1854), St. Kilda and Melbourne (1857) and Brighton and Melbourne (1859); telegraph services began to Williamstown (1854) and Adelaide and Sydney (1858); the Yan Yean water supply began (1857); and the Council built its first town hall (1854) and improved the boggy streets by tree-stump removal, paving and drainage. The cemetery west of Queen Street and north of Franklin Street was closed, except for families with graves or vaults. A market was opened to its east in 1857, and gradually expanded on to the cemetery, as remains were disinterred, to form the Queen Victoria Market. Queens Wharf, in front of the Customs House, was the river port around the swing basin. Private wharves were built along the river between King and Spencer Streets. The Government Immigration Depot was about one block to the north. Boarding houses sprang up around it. Inner Melbourne became commercialised with merchants, agents, clothiers, tinsmiths, timber yards, brick yards, agricultural implement makers and a galvanised iron factory. Bluestone, although costly and difficult to dress, appeared, and was a more durable building material. Banks moved away from the port area, establishing an early presence in Collins Street. The banking precinct, corner of Queen and Collins Streets, c.1910. The ES and A Bank is on the left. It is on the Victorian Heritage Register. The eastern end of town was marked by an ecclesiastical and educational precinct at Eastern Hill. The Houses of Parliament were built at the end of Bourke Street in 1855-6. This elevated tone was lowered in many citizens’ eyes however, as a Chinatown grew nearby. It was between Bourke and Lonsdale Street, from Swanston Street to Spring Street and between Lonsdale and La Trobe Streets, from Russell Street to Spring Street. Bourke Street was also the entertainment precinct, inhabited by dubious actresses who solicited in foyers. Superimposed on Chinatown was the brothel quarter, Madam Brussels’ establishment at 34 Lonsdale Street being the most notorious. (There were also active areas in Little Lonsdale Street and in the many hotels along main streets.) They made a lurid literary cocktail for several generations of journalists, and a battleground for various religious missions. The east end precincts, from a street directory, c.1947. Nearly all the lanes in the north-east quarter were built over by 1997. Other precincts emerged: retail in Collins and Bourke Streets in the centre of the city (the “Block” and several arcades being notable examples); softgoods along Flinders Lanes, moving eastwards from the warehouses in the west; medical along Collins Street and in Lonsdale Street near the Melbourne Hospital; and furniture at the east end, not far from Chinese furniture makers. Small workshops, cordial makers, tobacco and cigarette makers, printers, engravers, plumbers and bootmakers inhabited small streets and lanes. Collins Street, looking eastwards from Elizabeth Street, c.1904. “The Block” is the large building, fourth from the corner. The density of Melbourne’s buildings intensified but growth upwards was delayed until hydraulic lifts allowed buildings to be more than three or four storeys. The boom-time 1880s coincided with the formation of the Melbourne Hydraulic Power Company in 1886. The resultant increase in floor values promoted the demand for more floor space. 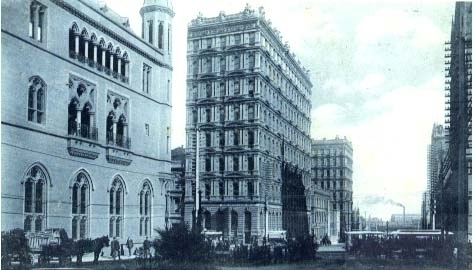 The Australian Building at the north-west corner of Flinders Lane and Elizabeth Street (1888) was comparable to the American skyscrapers. Height increases coincided with steel construction and improved fire resistance of buildings. Many of central Melbourne’s best regarded streetscapes date from these years, as do most of the commercial buildings on the Victorian Heritage Register. The increased building density and decades of literature on the miasmic dangers of unsewered dwellings finally produced the will for a metropolitan sewerage authority, the Melbourne and Metropolitan Board of Works (1890). Its long time champion, Melbourne’s town clerk, became its first chairman. The Old White Hart Hotel, Bourke St., Melbourne, c.1908. The collapse of the boom was followed by a rural drought during 1895 to 1902. There was long-term depression and recession. Fortunately for central Melbourne the transport utilities were in place, with railway lines from the suburbs and a dense network of cable trams, mostly put in service between 1887 and 1890. In 1911 Sidney Myer opened a department store in Bourke Street, beginning a period of central city retail dominance which lasted until the early 1950s. When Myer opened his store some of the large shopping areas were in Smith Street, Collingwood, Chapel Street, Prahran, and Bridge Road, Richmond. Wage earners shopped in the suburbs, and wage earners who lived in the city were likely to patronise the Eastern Market. Myer adopted aggressive selling techniques and his entry coincided with the increasing popularity of city picture theatres. In 1927 the mighty Foy and Gibsons expanded from Smith Street into Bourke Street. Within ten years their city sales were five times their Smith Street sales. Ball and Welch, who had been in Carlton since 1875, closed the Carlton store in 1930 and concentrated on the city store. G.J. Coles came to Bourke Street from Collingwood in 1924, expanded to the Coles Book Arcade site in 1939 (no relation), and had three large variety stores in the city by 1955. In 1905 the central city’s first reinforced concrete building was erected, and numerous other examples followed before the first world war. The 1920s saw reinforced concrete extensively used, and in 1929 welded steel frameworks were introduced. That year also saw the landmark Temperance and General (T&G) head office built on the elevated corner of Russell and Collins Streets. By 1933 it, along with the new Manchester Unity building one block westwards, dominated Melbourne’s skyline. Only the spire of St. Pauls Cathedral came near them. In 1913 a Parliamentary Committee issued a report on slum housing. Although the brothels had moved from Little Lonsdale Street to the suburbs, the east-end housing came under scrutiny. The actual building fabric did not alter much, perhaps because the popular C.J. Dennis books of verse (Moods of Ginger Mick, 1916, and Rose of Spadgers Land, 1924), lent the area a less unattractive aura, and probably because many buildings were converted to industrial uses. Building activity virtually ceased during the 1940s and early 1950s, although the Russell Street police headquarters (1940-43) was an exception. Some smartening up came with civic decorations for the Coronation, Royal Visit and the Olympic Games. City traffic grew sharply during the early 1950s. The Council had installed the first traffic lights in 1930, but the impact of congestion was highlighted when the first parking meters were installed in Bourke Street and Collins Street in 1955. Treadways (draper) one block away wanted meters too, so that long term parkers would be discouraged and more customers could find parking space. In the early 1950s the Commonwealth Government began a (probably unintended) slum-reclamation movement by acquiring most of the block bounded by La Trobe, Spring, Lonsdale and Exhibition Streets. Its high-rise green-clad building was erected in 1958. That was two years after a near neighbour, the I.C.I. building, was started. The I.C.I., Melbourne’s first curtain-wall building, was also the first to go over the height limit of 40 metres, dictated by the reach of fire-fighting ladders. The abandonment of the height limit led to higher buildings on larger sites, often set back with forecourts. An era of site consolidation began. Category: Central city sales as a percentage of metropolitan sales. Forty years later only the first three categories had a significant presence in central city retailing. Car showrooms had gone by the 1980s, as had most furniture showrooms. Picture theatres suffered rapid decline when television came, but city theatres lasted better than suburban ones. Theatre proprietors got out of big auditoriums, and one much lamented venue was the Regent Theatre which was sold to the council for part of a city square, opposite the town hall. The city square project was initiated by a Lord Mayor, Councillor Sir Bernard Evans, a practising architect. The council engaged in extensive site consolidation, closing down the Queens Walk arcade and the Regent Place shopping precinct. The loss of the area’s retail critical mass probably contributed the virtual extinction of retailing in that part of the city, leading in time to the demise of the flagship of retail exclusiveness, Georges Ltd. (1995). The city square did not achieve its planned potential because of a union ban on demolition of the Regent Theatre. In the 1990s over half the square was sold to private interests for construction of a hotel in conjunction with a refurbished Regent Theatre. Further east along Collins Street, the “Paris End” of the 1950s and early 1960s, commercial development was attracted to the best address in town. The Collins Street Defence Movement (1976), came too late in the opinion of most observers to save much of the old streetscape. The west end of Collins Street was also a good address, and high rise spread from there to King, William and Queen Streets. The council also promoted site consolidation in the block bounded by Lonsdale, Elizabeth, La Trobe and Swanston Street. It lay on the route of the planned underground railway around the central city’s periphery. Ultimately a large part of the site was occupied by a multi-storey office building and the city’s third big department store, Daimaru, (1991), six years after the completion of the underground railway. Fragments of the old landscape remain in the form of the shot tower, enclosed in a glazed cone, and a few lanes not absorbed by the redevelopment. Sniders Lane reminds pedestrians of Sniders and Abrahams cigarette factory, and a large building in Drewery Lane has been converted to apartments. While the irresistible tide of office building engulfed the city in the 1980s, some councillors took up the cause of inner-city residential living. The office glut depressed rents, older low-rise buildings were vacated, and their conversion to residential use became economically sensible. Ground-floor modifications provided off-street parking space for the residents who kept their cars. The demand for inner-city living was quickened by the postwar baby-boomers’ disenchantment with the cream-brick suburbs, now that the children were off their hands, and younger people liked the proximity to work and entertainment. Inner-city living provided a patronage catchment for cafes and bars, gymnasiums, small convenience stores and entertainment venues. Whilst the central city was still the biggest of several regional shopping areas in metropolitan Melbourne in the 1990s, it also gained more of a local shopping component. When cinema resurged in the 1980s the suburban drive-in shopping centres claimed most of the new growth, and the central city ceased to be anything special. Live entertainment, however, was different. At the south end of King Street and in adjacent Flinders Street nineteenth century warehouses were converted into night clubs during the 1980s. The city’s retail spine is along the blocks between Elizabeth and Swanston Street, with pedestrian bridges over Little Lonsdale, Lonsdale and Little Bourke Streets, conveying shoppers between Myer/David Jones in Bourke Street to Melbourne Central above the underground railway station. Collins Street is less intensively shopped and shopping weakens considerably at Flinders Street. It makes a sobering contrast with the shopping precinct which once existed at the Flinders Street station where the Mutual Store catered to the carriage trade. An easterly retail precinct extends along Bourke Street, Little Bourke Street (Chinatown) and Lonsdale Street (Greek precinct). Bourke Street east hosts a high proportion of entertainment venues. Swanston Street, the city’s civic spine with Princes Bridge at its south end, increasingly became a traffic conduit. Relatively inactive uses along the St. Pauls’ Cathedral, City Square, Town Hall, Queen Victoria Hospital, State Library, and Royal Melbourne Institute of Technology frontages lessened pedestrian activity. 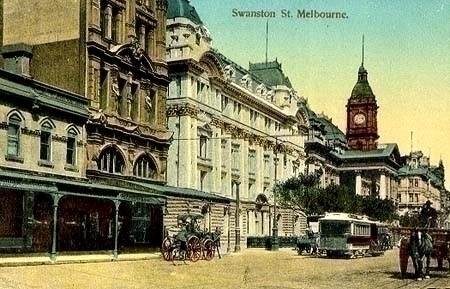 In 1992 Swanston Street’s footpaths were widened, most vehicular traffic (except trams) was prohibited, and the thoroughfare named Swanston Walk. It has not been as successful as the single-block Bourke Street Mall (1983), crowded with city shoppers and buskers who manage to keep clear of passing trams. An unchanging feature of the west end has been the legal fraternity’s precinct. The Supreme Court (1874) in William Street has as near neighbours the Federal Court, the County Court and the Magistrates’ Court. Owen Dixon Chambers accommodates the barristers. The finance and business sectors also inhabit the west end of town, causing lunch-time eateries and gentlemen’s outfitters to move there from the middle of town. The medical and dental professions have a continued presence at the east end of Collins Street. As the central city’s building profile has grown skywards, once prominent buildings are overshadowed. In the 1960s the Herald Sun building and its radio masts, viewed from passing trains, dominated the skyline. In the 1990s it was low-rise. Also visually dominant was a later generation of medium-rise buildings including T&G, Manchester Unity, Myer Stores Bourke and Lonsdale Streets (1930s), Police Headquarters, Russell Street, Herald-Sun, Southern Cross Hotel in Exhibition Street (1962) and the Reserve Bank, Exhibition Street (1965). The last three of these have been overshadowed by post-1960s high-rise buildings. The prominent ones, either standing well above their neighbours or with eye-catching facade treatment, include BHP House (1972), ANZ towers (1981), Nauru House (1977), Rialto Towers (1985), 101 Collins Street (replacing the Conzinc building, 1960s), 333 Collins Street (incorporating an historic banking chamber, 1990) and Melbourne Central. The Museum railway station underneath was renamed Melbourne Central, virtually upon the announced transfer of the Museum from Swanston Street to the Carlton Gardens. Rialto Towers has an observation deck with views over Southbank, Docklands, and Port Phillip Bay. Some central city churches stand out either because of tall spires of the attractiveness of their settings. Grassed open space is a rarity. The best area is in front of the State Library. The grass surface of the city square was trampled under by demonstrators in the 1970s, and paving was substituted. Several building were given plot ratio bonuses for forecourts during the 1960s and 1970s, but the meagre use made of many forecourts resulted in a reversal of planning policy extending buildings back to the street alignments. The best surviving forecourt is in front of the National Mutual building, erected on the council’s former Western Market site. Small plazas near the general post office and the town hall proved popular, and the council commercialized its plaza by putting an up-market eatery on it in a bid to lift the tone of Swanston Walk. Open space is provided on three of the central city’s four edges: Flagstaff and Carlton Gardens (north), Parliament and Gordon Reserves, Fitzroy and Treasury Gardens (east), and Enterprize and Batman Parks (south). The last ones return Melbourne to its origins, placing the Batman and Fawkner contestants beside each other, west of the Yarra River falls where Lancey anchored the Enterprize. Moving from east to west there are the Royal Society buildings, a scientists’ society in a building dating from 1858, the Horticultural Hall (1873) and police and penal establishments – Old Melbourne Gaol (1853), City Court (1911) and the former Russell Street Police Headquarters (1944). The Royal Melbourne Institute of Technology occupies nearly a whole block, including the former Emily McPherson College (1925). Near the Institute is the City Baths (1903). Across Swanston Street are air line and bus terminals, hotels and the historic Mac’s in Franklin Street (1853). The Dairy Produce Section of the Queen Victoria Market is in Elizabeth Street, on a market reservation of 1859. At its rear (and in the West Melbourne postcode area), are the market sheds and covered areas, originally for wholesale and retail fruit and vegetables, but retail since 1969 when the new wholesale market was opened in Footscray Road. At the Yarra River end of St. Kilda Road the Victorian Arts Centre was opened in 1968, later enlarged to include the Concert Hall, State Theatre and Victorian College of the Arts. BP House was converted to Domain Towers (apartments) and the site of the Homeopathic/Prince Henry’s Hospital (demolished 1994) was earmarked for apartments. Throughout the commercial developments and return to residential living St. Kilda Road kept its plane trees and green trams. The population census for the central city in 1996 was 6,373 persons, but many of those were hotel guests. The figure in 1991 was 3,592. A clearer estimate of the resident population is available from the dwellings census, 575 in 1991 and 1,182 in 1996. Annear, Robyn, “Bearbrass: Imagining Early Melbourne”, Read Books Australia, 1995. Boys, R.D., “First Years at Port Phillip”, Robertson and Mullens Ltd., 1935 (a chronology ending at 1842). Buckrich, Judith Raphael, “Melbourne’s Grand Boulevard: The Story of St. Kilda Road”, State Library of Victoria, 1996. Cannon, Michael, “Old Melbourne Town Before the Gold Rush”, Loch Haven Books, 1991. Cannon, Michael, “Melbourne After the Gold Rush”, Loch Haven Books, 1993. Davison, Graeme (ed. ), “Melbourne on Foot: 15 Walks through Historic Melbourne”, Rigby Publishers Limited, 1980. Dunstan, David, “Governing the Metropolis: Politics, Technology and Social Change in a Victorian City: Melbourne 1850-1891”, Melbourne University Press, 1984. Lewis, Miles, “Melbourne: The City’s History and Development”, City of Melbourne, 1995. Williams, W. Lloyd, “History Trails in Melbourne”, Angus and Robertson, 1957.